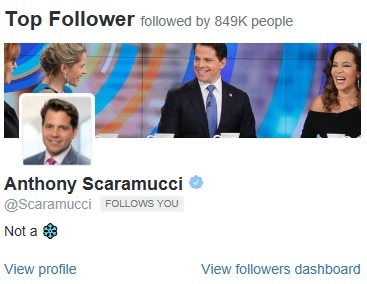 Why is Anthony Scaramucci following us on Twitter? If you don’t know or don’t remember The Mooch, check out his Wikipedia page. He achieved fame as the shortest-lived White House Communications Director, having held the post for just ten days before being fired by President Trump. He has a background in banking and communications, so would seem an unlikely follower for the Indigo account to pick up. Not much of a mystery here, really, and The Atlantic produced an article on this very topic a few months back. I don’t know how long we will keep Mr Scaramucci’s attention, but hope he’s enjoying reading our tweets in the meantime. Indonesians can’t get enough of our site. That’s right, Indigo is big in Indonesia right now. Since August this year the Indigo website has been steadily picking up more and more Indonesian visitors. In August, they were the fourth single largest country in terms of visitor numbers and in September jumped to first place. We love all of our website visitors, of course, but are struggling to understand our sudden surge in popularity among the archipelagic nation. A quick search of our site reveals only one mention of Indonesia (and that was back in 2013) and most of our posts and news items are about African nations. So our unexpected popularity is baffling, especially as the countries that account for most of our visitors are easy to understand – the UK (where we are based) and places like Nigeria, South Africa and Uganda where we fund organisations and regularly write about. If anyone can explain it, please do! Even and uneven gender splits. On Facebook, we are overwhelmingly popular with men who make up 72% of our followers. On Twitter, however, the gender split is much less stark (58% male; 42% female). There are probably a thousand possible explanations for that split and to be frank without a much more detailed understanding of social media use and users in the countries where our followers are, it’s not an area I can even get into. But should we even trust the data to begin with? Well, Twitter has recently found itself in hot water after it was revealed that the social networking site guesses your gender based on your interests and posts (unless you choose to define your gender when you sign up). I took a look at the Indigo Twitter profile – it guessed we were male and aged 13-54. When Twitter starts to give organisational profiles a gender it quickly becomes apparent that maybe we should take those stats above with a pinch of salt. Btw, if you want to see your interests, age and gender – as guessed by Twitter – log in to your account, go to ‘Settings’ and click on ‘Your Twitter Data’. It’s a good way to while away the time. But as well as the mysteries and the oddities, there are some useful pieces of information contained within the reams and reams of analytics we can access. For instance, I know that our site is most popular on Monday mornings at 11 and Friday mornings at 10, so maybe that’s a good time to post material. On Facebook, we have plenty of followers in Nairobi, Lagos and Accra, so we can think about more tailored content relevant to people in those cities and countries. And on Twitter, people respond more to content that explains and explores our work and that of our grantees, rather than simple links through to other sites. But as for Twitter’s assertion that 8% of our followers love Mexican food, I’m not quite so sure. Now where did I put that recipe for tacos?? ?